One of the fundamental objectives of Public Safety Canada's (PS) crime prevention activities is to assist those responsible for the implementation and delivery of crime prevention in making the best informed decisions about what to implement in their community. In order to achieve this objective, PS develops and disseminates practice-oriented knowledge on effective and cost-effective preventative interventions. This is done through rigorous impact evaluation studies of selected community-based prevention projects funded by PS to determine what works, how it works and at what cost (Smith-Moncrieffe, Lauzon and Jobin, 2008). Through the project funding made available under the National Crime Prevention Strategy (NCPS), PS supports the implementation of community-based projects that respond to specific priorities such as youth gangs, youth violence and bullying. Most of these community-based projects aim to implement interventions that address criminogenic (risk) factors that are known to be related to an increased likelihood of offending, and protective factors that decrease this probability. Once the research division within PS determines whether and how these projects contribute to crime prevention, stakeholders, including provincial and territorial governments are encouraged to sustain the projects or effective project elements in order to expand crime prevention efforts throughout Canada. The purpose of the Sustainability Study was to determine the extent to which NCPS funded crime prevention projects were sustained following their five year funding period. The Sustainability Study began by establishing a sample of projects from over 600 crime prevention projects funded under the NCPS since 2007. The internal Public Safety Canada Sustainability Working Group had previously identified 95 projects that had concluded their funded period and had completed their projects recently enough for contact information to be readily available. Through an electronic file review and discussions with PS staff, it was determined that 44 of the 95 projects were sustained, either in whole or in part. Of these 44 projects that were approached, a total of 20 projects agreed to participate in the Sustainability Study. The sample of 20 projects participated in either a key informant interview (12 projects) or responded to an online questionnaire (8 projects). The interview guide was piloted with three projects to ensure the questions were clear and would lead to informative answers. Thematic analysis was conducted using the results of both the interviews and questionnaires. It should be noted that the projects contacted for the sustainability study represent a very small sample of all projects funded by the NCPS since 2007. Also, given the retrospective nature of this study, there was a high turnover of project staff making it difficult for new staff to compare past and current project practices that are necessary to determine levels of sustainability for each project. Given these challenges, the results cannot be seen as representative of all NCPS projects but do provide some insights for further research. Of the 20 projects sampled, 18 projects were sustained in full or in part, and two projects were not sustained in any form. Of the 11 projects that were sustained in full, five found opportunities for growth and expansion. Of the seven projects that were sustained in part, four projects changed the core elements of the original project and three projects maintained only core elements of the original project. Of the 18 projects that had been sustained in full or in part, the aspects of the projects that were sustained included: guiding frameworks; public relations and marketing strategy; project steering committees; advisory groups / boards; policies and guidelines related to community engagement; staff training policies / materials; instruction materials for project / service delivery; participant recruitment protocols; participant satisfaction surveys; parent and participant consent forms; and evaluation methods. Respondents indicated that there are several key factors which contributed to the sustainability of their projects. Of primary importance to sustainability was the provision of NCPS funding periods longer than two years and the availability of new funding sources during the project. In addition, networking, lobbying public officials and demonstrating program impact through evaluation results were helpful strategies in maintaining existing funding and obtaining new funding. Strong leadership from the project's management and skilled project staff were also crucial to the project's sustainability. Respondents also noted that refining administrative procedures, service delivery methods and staffing procedures to attract and maintain qualified staff also contributed to the sustainability of projects. Allowing a degree of autonomy at individual project sites and the existence of strong relationships with community partners also contributed to sustainability. In contrast, respondents noted that the main factor which decreases the potential for sustainability is the lack of secure long term funding. This in turn hinders the organization's ability to attract and maintain skilled staff, which results in poor project management. Lack of government and community support were also cited as challenges contributing to the inability of projects to be self-sustained beyond project funding. The study also examined how participation in an evaluation could support project sustainability. Three quarters of the respondents indicated that participating in an impact evaluation had a positive impact on their project. The primary benefit of the evaluation was that it gave the project an opportunity to understand what was working and what was not working, allowing the project and practices to be modified accordingly. By providing evidence that a project was generating expected results, the evaluations also helped to increase the credibility of effective projects with community partners. Over a third of respondents mentioned that they had continued to value and use evaluation methods following the termination of NCPS funding, including data collection strategies and established baseline targets. When asked how they would advise other organizations hoping to sustain their projects, staff from 15 projects indicated that performance measurement and evaluation must be prioritized in order to enhance project sustainability. Building a collaborative and supportive network of partners, as well as strong internal leadership was also noted as crucial to enhancing sustainability. Respondents also noted that projects should be piloted for at least four years and the organizations should be flexible enough to adapt to changing community needs. Planning for the sustainability of the project in the project and evaluation plan beyond NCPS funding was also noted as key to the longevity of projects. That a re-contact survey be developed and administered to past NCPS funding recipients to determine the sustainability and adaptation of the projects. Sustaining effective elements and projects conducive to crime prevention reduce the chances of youth at risk becoming involved in the criminal justice system. Harry Cummings and Associates. (2017). 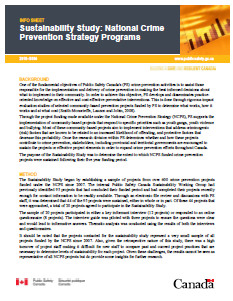 Sustainability Study: National Crime Prevention Strategy Project: Final Report. Ottawa, ON: Public Safety Canada.